"Tree lobster thought to be extinct for 80 years found alive clinging 500ft up on remote Pacific rock taller than Empire State Building"
Wow, way to hang in there! I want one as a pet. They look really cool. Plus it would freak out quite a few people. I know this isn't a ceph. 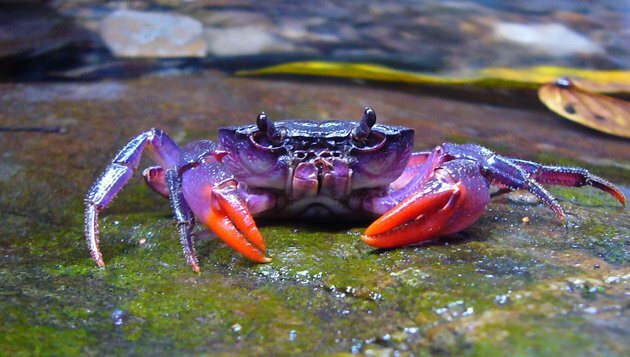 It's a newly discovered, pretty little crab in Shari's color. Mike wrote: I know this isn't a ceph. You did mean in Shari's KITE color ... yes? No Tom, he really meant Shari's color. I had a strange reaction to the sun and and my skin turned a weird purple color. Here's a school of Caribbean Reef Squid. Filmed a couple days ago off Grenada. Cute little buggers. Looks like they're swimming in formation. I saw a few schools of them, they were probably about 12" long. Next I'll have to post the Eel vs Octopus video. It's not good for the Cephalopod though. Here it is, a sad octopus video, but a happy day for the eel. I don't know why the eel ties itself in knots, but it looks cool. Probably just showing off for the camera!